Teaching pronunciation is one the most challenging parts of ELT in Bangladesh. Very few research and least attention on pronunciation teaching has instigated those challenges more. Moreover, setting an ambitious target to achieve native like pronunciation and teaching without considering the Bangladeshi context are more specific reasons for creating those problems. 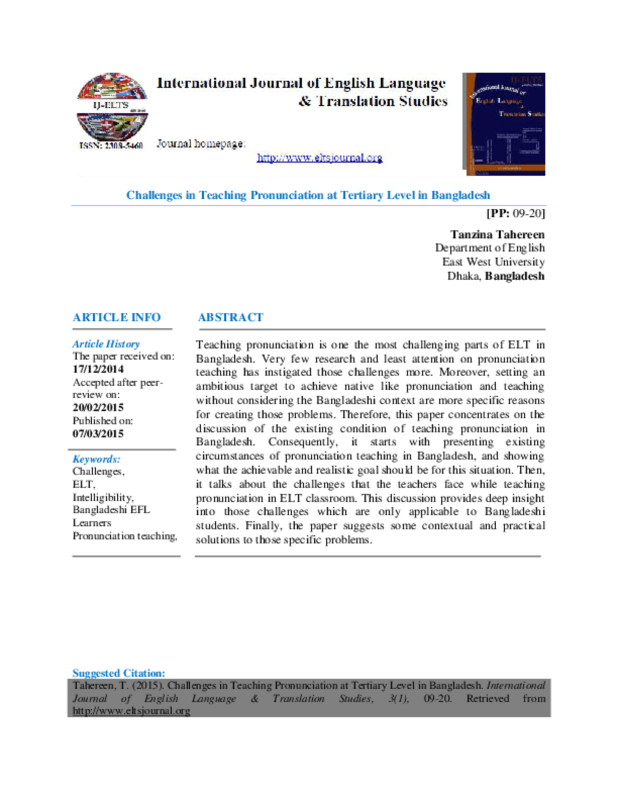 Therefore, this paper concentrates on the discussion of the existing condition of teaching pronunciation in Bangladesh. Consequently, it starts with presenting existing circumstances of pronunciation teaching in Bangladesh, and showing what the achievable and realistic goal should be for this situation. Then, it talks about the challenges that the teachers face while teaching pronunciation in ELT classroom. This discussion provides deep insight into those challenges which are only applicable to Bangladeshi students. Finally, the paper suggests some contextual and practical solutions to those specific problems.